If you’re struggling with one or more teeth that are injured, decayed, or lost altogether, a custom-made restoration can help correct the problem and restore your oral health to its fullest potential. Contact our Chevy Chase, MD practice today to schedule a first appointment, or if you have any questions for our staff. Dr. Ronan Freyne looks forward to providing you with a skilled and comfortable and caring experience that leaves you ready to smile. A tooth is suffering from advanced decay that is too severe for a filling. A tooth has an existing filling that needs additional support. A tooth has been cracked, fractured, or otherwise injured. A tooth is suffering from cosmetic imperfections that need correction. A missing tooth has been replaced with a dental implant that needs restoration. 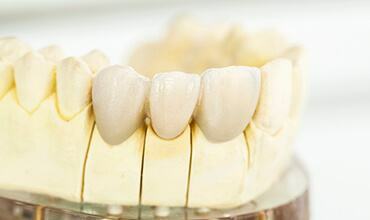 Fixed bridges are designed to replace one or more missing consecutive teeth along a single arch of the mouth. 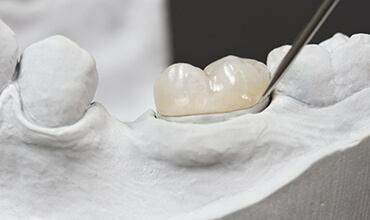 Unlike traditional dentures, bridges are anchored in place within the mouth by attaching dental crowns over adjacent healthy teeth in order to keep the prosthetic securely in place – for this reason, the ongoing success of your new bridge will depend on the health of the surrounding teeth and jaw. With a new bridge in place, patients are able to improve their biting stress and better maintain the natural shape of their face.